Since the so called Arab spring there has been a growing interest in the causes and consequences of non-violent resistance (NVR) campaigns. These campaigns essentially involve unarmed people, who use a combination of tactics such as strikes, sit-ins, and demonstrations in order to achieve political goals.For instance, during the Jasmine Revolution in Tunisia, it was not an armed insurgency but mostly demonstrations and general strikes which led to the ousting of long-term ruler Ben Ali in January 2011. However, whereas lot has been written on how and why civil resistance works to depose dictators, we know little about the long term effects of NVR. How are the odds for democracy to endure in countries such as Tunisia, which is right now experiencing a transition from autocracy to democracy? Will there be a stable democracy ten years from now or will the country slide back into a new dictatorship? In our research we investigate if and how NVR campaigns influence democratic survival. We study the sustainability of democratic regimes, which evolved out of a transition event (e.g. a revolution). Building on the idea of path dependence, we suggest that those democratic regimes, which came into being with the help of an NVR campaign, are more robust against an autocratic backslide (e.g. the once democratically elected ruling party restricts civil liberties) and better achieve democratic consolidation. Our main argument goes as follows: Successful NVR campaigns depend on mass participation and represent a diverse coalition of actors. These sorts of movements need a culture of compromise to balance their constituent interests. This will help to shape a democratic political culture that values compromise and cooperation after transition. More precisely, we argue that if an NVR campaign is involved in democratic transition, its political culture spills over to the subsequent new regime via multiple channels. Veterans of the NVR movement may get directly involved in politics (e.g. voted into parliament or assume government or administrative posts). An NVR campaign can spawn a democratic party, or watchdog institutions like NGOs or media to monitor the state of democracy from the outside. In order to evaluate this argument, we looked at historical cases of democratic survival and breakdown. Using data from Ulfelder, we compiled a sample of 112 democratic regimes, which succeeded an autocratic regime during the time period 1955 to 2010. Additionally, we added the information whether the transition to democracy was shaped by NVR, using data from Chenoweth und Lewis. For this sample of cases, we looked at the survival of democracy, which we defined as the endurance of basic democratic attributes over the course of time (more information on the definition of democracy and NVR can be found in our working paper, linked above). 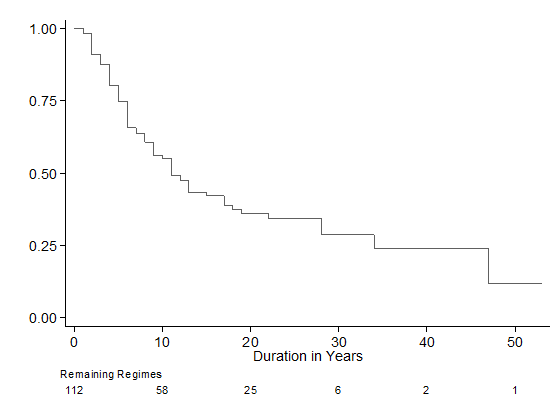 The figure below shows the survival times of all regimes in our sample. As you can see, we treat these regimes like a group of patients in a medical study. All regimes start at time zero and we observe the proportion of regimes that survive over time. At the beginning of the study time, the sample consists of all 112 regimes and over time more and more regimes disappear, because they experience an autocratic backslide. Now to analyze the effect of NVR on democratic survival we categorized regimes according to presence of a NVR campaign during the transition phase and whether a NVR campaign was involved in the deposition of the preceding autocratic regime. In the next figure we see the survival time of regimes that were shaped by NVR compared to all other regimes in the sample (i.e. regimes that experienced a violent resistance campaign and regimes that were constituted without a resistance campaign). As shown above, those regimes that were shaped by NVR appear to survive longer than regimes without this attribute. 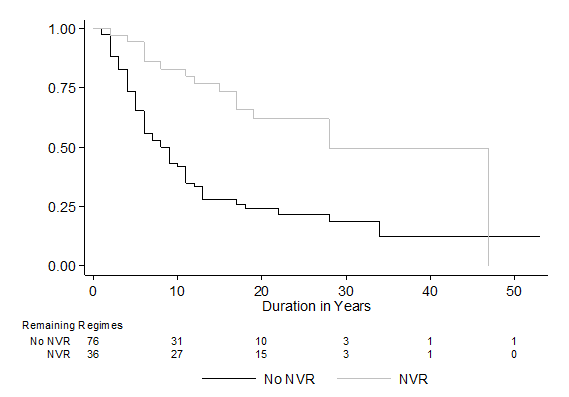 The survival line for the NVR group drops much slower than the line for the “No NVR”-group. The median survival time of regimes with NVR is 28 years, whereas regimes without NVR have a median survival time of nine years. To get a more detailed picture, we broke down regimes into three categories: 1) no resistance campaign, 2) violent resistance campaign and 3) non-violent resistance campaign. The next figure shows the results. 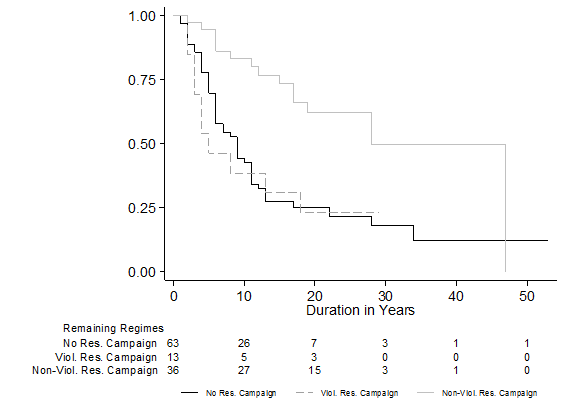 Whereas the survival rates for regimes with no resistance campaigns and violent resistance campaigns look quite similar and overlap to some extend, the survival rate for regimes with NVR is substantially higher, indicating again that regimes in this group survive longer than those of the other two categories. Our measurements of democracy and NVR campaigns are very crude. Especially the measurement of NVR is challenging, because the level of violence, which occurred during resistance campaigns, is difficult to specify (e.g. was Euromaidan predominantly violent or non-violent?). We assume that our 112 regimes are sufficiently comparable and that we are not comparing apples with oranges (Can we compare Burma in the 1960s with Ghana in the 1990s?). Our analysis does not show how the effect comes about (e.g. direct involvement of NVR veterans in politics, the absence of an armed veto power, or the combination of both). So, further research is needed to learn more about the mechanisms, which drive the effect. Concluding, we may have found some interesting patterns, which point to a positive effect of NVR for democratic survival and democratic consolidation, but we should be cautious in the interpretation of our results until more research is done. Markus Bayer is a research assistant and PhD-Student at the chair of International Relations in Duisburg. Felix Bethke is a Post-Doc fellow at the Center for Global Cooperation Research in Duisburg. Daniel Lambach is an Interim Professor at the Chair for International Relations in Duisburg.